Qualcomm is expected to maintain its top ranking in terms of global smartphone AP shipments in third-quarter 2018, with total shipments nearing 200 million units. Enjoying a high penetration among leading smartphone vendors, Qualcomm will outperform its rivals in terms of third-quarter 2018 shipment growth, as downstream vendors prepare inventory for the high season. With consumer spending on smartphones trending upward in 2018, smartphone sales are again concentrating on a few leading brands, which will favor Qualcomm. The top-three smartphone AP vendors - namely Qualcomm, MediaTek and Apple - will together command a market share of over 80% in third-quarter 2018, and their combined share will drop to 76.6% in first-quarter 2019, as Qualcomm is expected to feel a major impact from competition from Huawei's and Samsung's in-house-developed smartphone APs. While this DIGITIMES Special Report provides figures of suppliers' shipments and market shares, it also offers insights into other aspects of the smartphone AP market, such as manufacturing processes, AI support and fast charging. The report shows how Apple's new products entering the market in third-quarter 2018 will drive the vendor's AP shipments and how the ratio of 7nm smartphone APs among the global total will grow rapidly to exceed 10%. As to the non-Apple camp, Hisilicon will take the lead by launching its 7nm Kirin 980 in sync with Huawei's flagship Mate 20 in third-quarter 2018 while Qualcomm and Samsung, lagging behind Huawei by one quarter, will begin inventory preparation in fourth-quarter 2018. All these factors will contribute to growing penetration of 7nm APs in the second half of 2018. It also notes how lower-than-expected iPhone X sales caused a decline, rather than an increase, in hardware-based AI accelerators in the first half of 2018. However, Apple's next-generation flagship smartphone AP will likely still incorporate hardware-based AI accelerators for AI tasks such as face or object recognition. This is expected to fuel the growth momentum of smartphone APs with hardware-based AI accelerators in the second half of 2018. 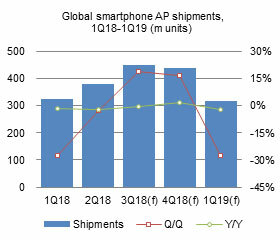 Smartphone APs with software-based AI accelerators, on the other hand, are showing slow growth, possibly beginning to exhibit a slight decline in their ratio in fourth-quarter 2018 due to seasonal factors.